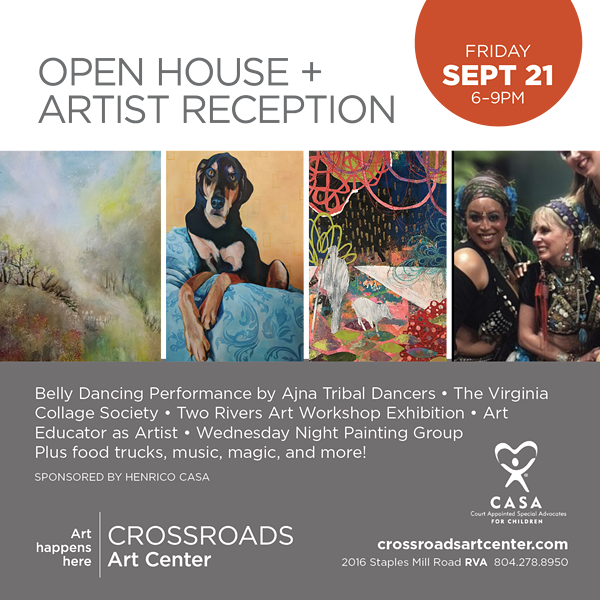 September 2018 Open House and Artist Reception | Crossroads Art Center | Galleries | Style Weekly - Richmond, VA local news, arts, and events. Join Crossroads Art Center for its artist reception and open house Sept. 21. Explore new exhibitions and discover your next favorite artist as well as food trucks, music and magic. Nonprofit Sponsor: Henrico Court-Appointed Special Advocates. Belly dancing class and performance: Ajna Tribal Dancers, who are are delighted to bring a form of follow-the-leader belly dance to Crossroads Art Center so that you can learn some moves and look like you know what you are doing. Featured exhibitions include “Exploring Imagination in Collage” by the Virginia Collage Society, Two Rivers art workshop, art educator as artist and the Wednesday night painting group.